Welcome back! In part 1 of this series, we discussed branding, Featured Apps, and Hero Apps as strategies to make your official enterprise apps more prominent so your users can discover them easier. Those strategies work great once a user has launched the player, but how do you get users to the mobile player and to a specific app? To illustrate the problem, I’ll use our conference app as an example. My team built a great app to run our global leadership conference. Thrive Conference was designed to be used as a mobile app since attendees would be using it throughout the conference and few of them were bringing their laptops. The app had a professionally designed UX where users could see speaker bios, register for sessions, add sessions to their agenda and outlook calendar, participate in polls, download presentation materials, rate presentations, network with colleagues, and participate in a Yammer chat room. We spent a lot of time optimizing the app so it launched quickly and felt snappy. It was a beautiful app, and people loved it – if they could find it. My colleague Eric and I, sitting at a help desk table by the conference entrance, were there to support our app. Despite several emails prior to the conference with step-by-step installation instructions, a long line of grumpy senior managers now stood before us: “Go to the app store…. No, you won’t find it by searching for that…. 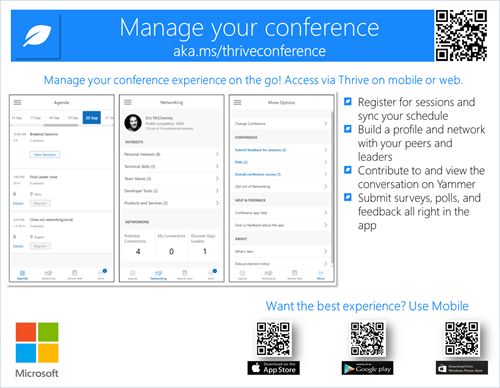 Search for PowerApps… Yeah, that’s one word… Now go to Featured… Search for ‘Thrive Conference’.” One down, 20 to go. So we developed some shortcuts to get people to the mobile experience quickly and keep them coming back – specifically by using URL Shorteners, QR Codes, and Push Notifications. This post explains how. We use a URL shortening service for our PowerApps URLs. For example, the current version of our Time Away app is at web.powerapps.com/apps/bb4c0292-f59f-17ba-c5e5-42edbaacf596 , but we share aka.ms/thrivetimeaway as the link to our users. The short URL abstracts the PowerApps URL. If you ever need to republish the app in a different environment the App ID and, by extension, the URL will change. The short URL can be modified to point to the new URL without impacting your users. Similarly, your marketing collateral and links from other sites will continue to work undisturbed. Your IT department can use the abstraction layer to its advantage. The short URL could point to a traffic manager that would redirect users to regional instances of the app for better performance or to a simple HTML splash page if you have to bring your app down for maintenance. Some services offer vanity URLs, where you get to pick the URL yourself, making it easier for users to remember the link. If someone sees a poster for your app, it’s unlikely they’ll copy down a shortened URL with a random string of letters and numbers, but they will copy or just remember a friendly name. Vanity URLs are also a great way to reinforce your brand. For example, aka.ms/thrive goes straight to the home app of our Thrive experience. Some services have analytics so you can see the traffic driven to your app through that link. The PowerApps admin portal does of course have usage analytics, but doesn’t tell you how a user got to your app. With a URL shortener you can create different URLs for different campaigns or referrers to see which is the most effective. We try to drive our employees to the mobile experience over the desktop experience whenever we can. Mobile launch performance, especially on newer devices, tends to be better than the desktop experience since the app package is installed on the client device. Mobile also offers compelling interactions like push notifications and speech to text. And it’s just more convenient – our employees always have a mobile device handy. QR codes are the fastest way to get users to install PowerApps on their mobile devices. iOS devices natively recognize QR codes when using the camera. Android users can similarly hold the Home button while using the camera to recognize QR codes. Whenever we announce a new app we’ll include an image like this that directs the user to their mobile app store to get the player first. Feel free to take the image below and drop it into your communications (click for higher resolution image). We also use QR codes for our apps, being sure to point them to a vanity URL rather than the direct link for the reasons explained above. 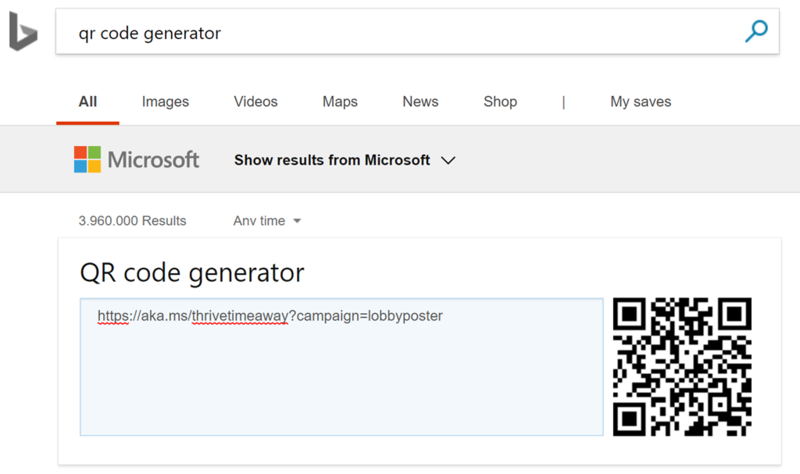 Bing conveniently has a QR code generator where you can paste in a URL and it will instantly generate a QR code image for you. Then simply right-click on the QR code image, copy it, then paste it into your marketing materials. As mentioned previously, create unique URLs and QR codes for each method of communication so you can measure the effectiveness of your campaigns. When the user scans a QR code with an app link, they’ll be prompted to launch PowerApps if it’s installed. Otherwise they’ll view the app in the mobile browser. Putting it all together, Eric created a flyer that displays our vanity URL, has QR codes for the mobile player, and a QR code for the app prominently displayed at the top. Like we said, we really like to get employees onto the mobile experience for performance and features. We also consider it our benevolent trojan horse for discovery, since we can use push notifications to drive traffic back to our apps. For example, every pay period we have a Logic App that calculates whether an employee has vacation hours that will be subject to forfeiture at the end of the year. If the employee has a forfeiture balance we send them a push notification. It arrives on their phone with the PowerApps logo, the name of our app (Thrive Time Away), and a short description. Tapping on the notification launches PowerApps, then opens the Time Away app where they’ll see their balance and can log their time off. We also use this for our Kudos app to send a notification to the recipient and their manager. Push notifications can send a parameter which PowerApps can interpret when the app is launched. For example, our home app shows a stream of cards with a unique card ID in the underlying collection. When we send a push notification to the Home app, we pass the card ID as a parameter and the Home app scrolls to that card. We use this to our advantage when we launch a new app. We create a card in the home app that announces the new app, then we send a push notification to our users directing them to that card. The card then has a short blurb about the app with a deep link to launch it. Free publicity! Your organization must have at least a PowerApps Plan 1 license. The user must install the mobile PowerApps application. See the previous section for tips on how to make that easier. The user must also allow push notifications for PowerApps. They will be prompted to do this when they install the app. The app must either be Featured (see previous blog post) or the user must have opened the app before. There’s a great blog post called Send a push notification in PowerApps that gives you more information on creating and using push notifications. In our case we created a webhook to trigger the push notification flow, but the rest of the mechanics are the same. Just be aware that if you’re sending to an SG there is currently a limitation of 10,000 recipients at one time. That’s it for this installment. Coming up we’ll talk about discoverability of PowerApps on the web, covering topics like deep linking, web embedding, and Bing for Business integration.